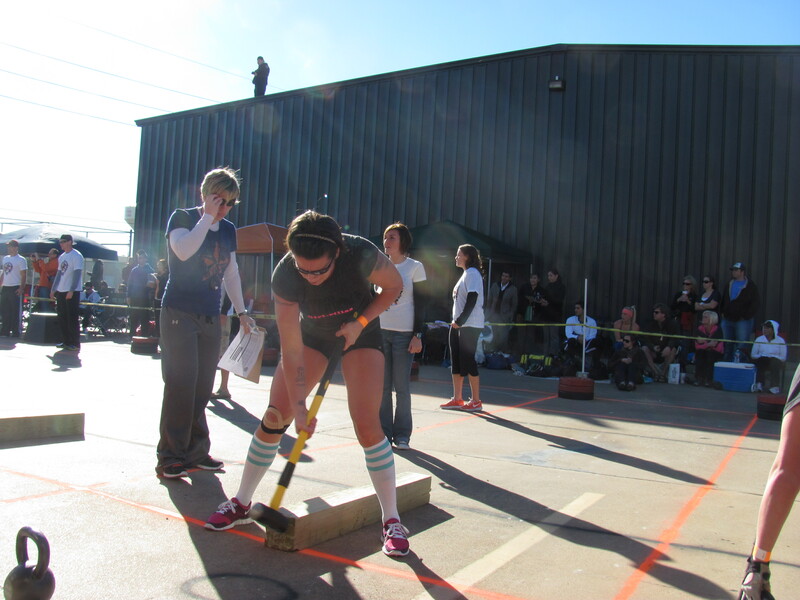 “Hammer and Chisel” Thanks to all the folks at Atomic Crossfit for throwing one of the best competitions we’ve attended. This WOD is based off of the first of the day, we are substituting KB swings for the sledge hammer and 6×6. After watching Val in action with the sledge hammer, I believe I will refer to her as Mam. Used 55 lb KBs and a 24″ box…….12:50. Utterly stupid maneuver on my part. I’ve got even more respect for Zach, Garrett, Ethan and Val. KBS had to be a lot easier than swinging a sledge at a 6×6. About halfway through this one (when it seemed like everyone else was already done), I was considering tapping out. Got 295 for 3 reps, up 40 lbs in 5 months. Subbed for the pushups but feeling better. Pulled 335# x3 – a PR by 30#’s! WOD: 45’s and 20″ @ 9:17. Alot of resting going on here. The squats tore me up and the hands off the ground thing destroyed my shoulders. I really need to improve ROM in those little rascals. Thanks for the motivation Garrett. a 385 3-rep deadlift at a bodyweight of, what, 165? Do the math, boys and girls, that is impressive! !